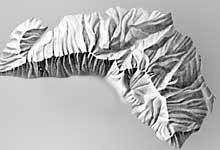 The light direction is very important for the design of a shaded relief. Normally the cartographer lets the light “shine” on the terrain from the upper-left. Less popular is illumination from the south, as the relief shading tends to not “look right”. 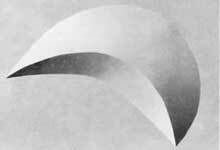 In extreme cases, relief inversion occurs where mountains appear as valleys and vice versa. If executed carefully, a shaded relief with southern illumination may depict the terrain with vivid and correct form. However, maps with southern illumination are generally more difficult to read. 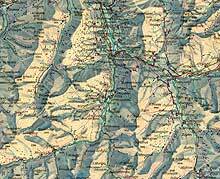 For a comparison, see the two maps of the Canton of Grisons below. North-western illumination. 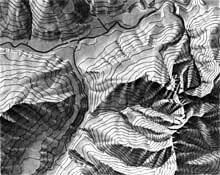 “Graubünden” (section), 1:250 000, 1945. 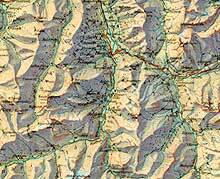 South-eastern illumination, “Carte de voyage des grisons” (section), 1:250 000, 1932. Wonderful, rare examples of maps depicted with a southern illumination are also “Rigi” by Fridolin Becker and the “Jungfraugruppe und Aletschgletscher” by Eduard Imhof. 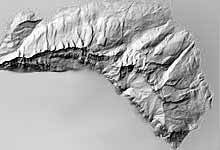 On a typical shaded relief, the optimal main light direction strikes mountain ridges and valleys at an angle of approximately 45°. 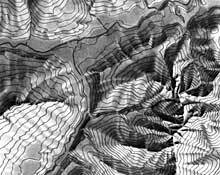 Emphasizing and clarifying important topographic features, such as ridges, valleys and watersheds, requires adjusting the direction of illumination to the characteristics of a given terrain. The top-left image below shows a stylized terrain under strict north-western illumination. On the top right image, adjusting the direction of illumination results in light striking the ridge from the top in the western part, and from the left in the eastern part. This adjustment avoids “dead” mountain ridges in transition zones, where the illuminated and the shaded sides of a mountain share the same shade of grey. Stylized terrain without local adaptation of the light source. Terrain with local adaptation of the light source. Analytical shading with illumination strictly from northwest (DEM © swisstopo). The lower left image shows a digital elevation model rendered with strict north-western illumination.